Yep, it's been awhile, I know. I`ve been working on a whole new project and it's sapping up my time. 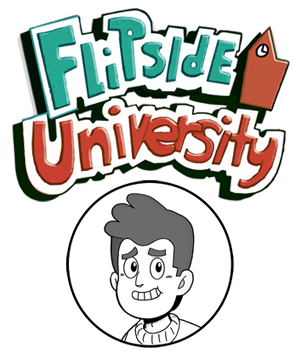 Don't worry though, Flipside U is still coming out. 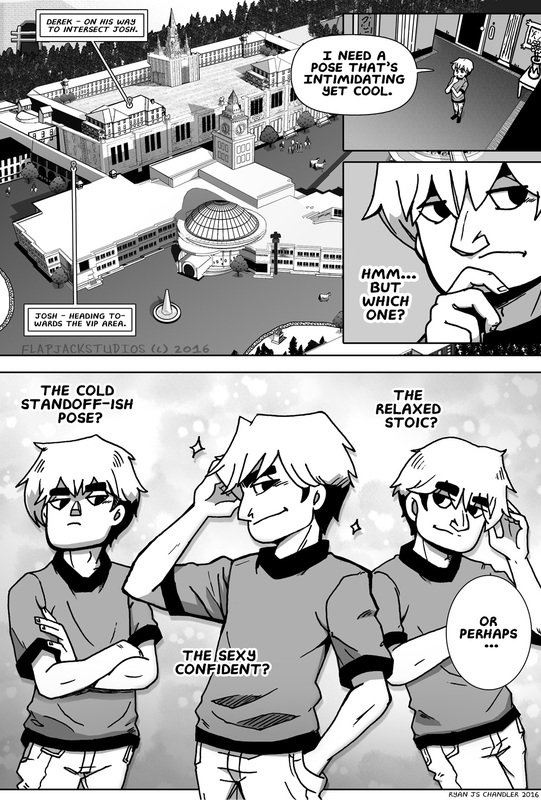 In fact, here's a new page called "Poses." I like Derek. I hope you do too. Here we see him practicing his various poses and trying to decide which one really says, I'm better than you. Haha. Maybe you want to learn a bit about poses too, or how to pose as cool as Derek? Well fear not, for I have scanned Wikipedia and have provided some exerts on coolness. Here we go. Coolness is an aesthetic of attitude, behavior, comportment, appearance and style which is generally admired. Because of the varied and changing connotations of cool, as well as its subjective nature, the word has no single meaning. It has associations of composure and self-control (cf. the OED definition) and often is used as an expression of admiration or approval. Although commonly regarded as slang, it is widely used among disparate social groups, and has endured in usage for generations. There is no single concept of cool. One of the essential characteristics of cool is its mutability what is considered cool changes over time and varies among cultures and generations. One consistent aspect however, is that cool is wildly seen as positive and desirable. Although there is no single concept of cool, its definitions fall into a few broad categories. 'Cool', though an amorphous quality more mystique than material is a pervasive element in urban black male culture. Majors and Billson address what they term "cool pose" in their study and argue that it helps black men counter stress caused by social oppression, rejection and racism. They also contend that it furnishes the black male with a sense of control, strength, confidence and stability and helps him deal with the closed doors and negative messages of the "generalized other." They also believe that attaining black manhood is filled with pitfalls of discrimination, negative self-image, guilt, shame and fear. "Cool pose" may be a factor in discrimination in education contributing to the achievement gaps in test scores. In a 2004 study, researchers found that teachers perceived students with African-American culture-related movement styles, referred to as the "cool pose," as lower in achievement, higher in aggression, and more likely to need special education services than students with standard movement styles, irrespective of race or other academic indicators. The issue of stereotyping and discrimination with respect to "cool pose" raises complex questions of assimilation and accommodation of different cultural values. Jason W. Osborne identifies "cool pose" as one of the factors in black underachievement. Robin D. G. Kelley criticizes calls for assimilation and sublimation of black culture, including "cool pose." He argues that media and academics have unfairly demonized these aspects of black culture while, at the same time, through their sustained fascination with blacks as exotic others, appropriated aspects of "cool pose" into the broader popular culture. George Elliott Clarke writes that Malcolm X, like Miles Davis, embodies essential elements of cool. As an icon, Malcolm X inspires a complex mixture of both fear and fascination in broader American culture, much like "cool pose" itself. And there you have it. END WIKI QUOTE.